Outposts in space, circling the Earth in satellite orbits at altitudes of several hundred kilometers, have been the subject of fictional essays as well as realistic engineering studies for more than a hundred years. Manned by engineers and scientists who made their observations and their discoveries, while enjoying life free from the restrictive influence of gravity, these satellites took various shapes and sizes in those early concepts. During the late 1940s, von Braun worked out a plan for a huge space wheel, rotating to create artificial gravity, and occupied by several dozen men and women who used their eerie vantage point to observe the Earth and the sky, and also to conduct experiments that could not be performed under the Earth's force of gravity. Von Braun was quick to assert, though, that such a station should not be built in the near future. Rather, we should start with a modest orbital station, consisting of the empty, modified tank of an upper stage of a large rocket capable of reaching orbital altitudes. This concept was alive in von Braun's mind during the early 1960s when the family of Saturn rockets for the Moon Project took shape. The third stage of the big Saturn V rocket, called S IVB, also used as second stage of the smaller Saturn IB, would be an excellent candidate for a first orbiting space station. Its large hydrogen tank would offer plenty of room for the astronauts and their activities. This concept was called the "orbital workshop." The smaller oxygen tank could be used as a depository in various ways. While these early plans were studied at von Braun's Marshall Center, another initiative was started by astronomers at NASA and at some universities. They suggested to mount several telescopes on a combined command and service module as used on the big Saturn-Apollo Moon rocket, to place that module into an Earth orbit, to have the telescopes operated by the astronauts in the command module through remote control, and later to return films and tapes with the astronauts to Earth. The telescopes would observe primarily the Sun in various wavelength regions. The entire assembly was called Apollo Telescope Mount, ATM, in 1963. Then, somebody had the splendid idea to combine the two projects, the Orbiting Workshop and the Apollo Telescope Mount, into one system that would be capable of addressing a broad program of activities, a program that eventually would embrace solar astronomy, stellar astronomy, space physics, space medicine, Earth resources observations, life sciences projects, material sciences, microgravity studies, spacecraft environment observations, and a series of student projects. In 1965, NASA established the Apollo Applications Office in Washington under John Disher. In the following year, new Apollo Applications Program offices were established at the Marshall Center and also at the Johnson Space Center in Houston. The first concept of the orbital workshop envisioned the launch of two Saturn IBs, one manned and one unmanned. The hydrogen tank of the second stage of the unmanned vehicle would be equipped with two floors, a second wall, and a hatch for the docking of an astronaut-carrying service and command module. Launched one day after the launching of this unmanned Saturn IB, the astronauts of the second Saturn IB would enter the empty hydrogen tank of the first Saturn IB, establish a breathable atmosphere, and mount instruments and facilities for various observations. They would sleep in the command module. The space engineers at the Marshall and the Johnson Centers, however, did not feel comfortable with this concept of a "wet" workshop. George Mueller, Associate Director for Manned Spaceflight at NASA Headquarters, shared their concern. A few days after the successful first landing mission on the Moon in 1969, he announced to Congress that NASA will drop the "wet" workshop scheme in preference to the "dry" workshop concept. The S IVB stage for that workshop would be fully equipped on the ground; a docking adapter, and airlock, solar energy panels, and an elaborate mount with a group of telescopes would be attached; the interior of the former tank would be furnished with all the facilities and commodities needed in a station where astronauts could work, eat, relax, sleep, and feel comfortable for periods of weeks and even months. The entire cluster would be launched with a two-stage Saturn V rocket. The astronauts, launched with a Saturn IB a few days later, would enter the workshop through the docking hatch. This concept would be far more satisfactory than the previous one, but it would be more expensive. Therefore, Mueller waited with his presentation to Congress until the latter's mood, under the influence of the successful Moon landing, would be positive. Indeed, the "dry" workshop project was accepted without a vote of dissent on July 22, 1969. 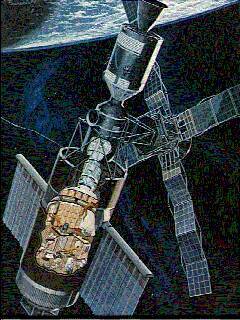 Two workshops, to be launched with two Saturn Vs and seven Saturn IBs, were envisioned as the beginning of an ongoing orbital station program; it was given the name Skylab by George Low on February 24, 1970. While overall management of the program was in the hands of NASA Headquarters, the Marshall Center was responsible for the Saturn IB and Saturn V rockets, for developing and integrating most of the major components such as workshop, docking adapter, airlock, Apollo telescope mount, shroud, and most of the experiments. Also, Marshall had responsibility for overall systems engineering and integration. The Johnson Center was responsible for flight operations, crew selection and training, some of the experiments, and modification of the command and service module. Also, the Johnson Center furnished all the crew systems, medical equipment, food, and other crew-supporting components, and was responsible for overall mission analysis and evaluation, particularly from the viewpoint of crew performance. Major companies involved in the Skylab project included Martin Marietta, McDonnell Douglas, Rockwell International, Boeing, and Chrysler. 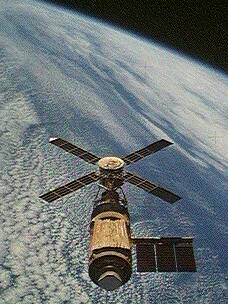 Skylab was launched on May 14, 1973, a little over twenty years ago. Minutes after the Saturn V had lifted from its launch pad, disaster struck. Years before, while Skylab was developed, it was decided that the big spacecraft should be protected against meteoroid hits by a so-called meteoroid bumper, a thin metal layer about two or three centimeters above the spacecraft surface. During ascent, this layer would rest directly on the surface of the spacecraft; it would be lifted to the desired distance by a lever mechanism once the rocket had passed through most of the Earth's atmosphere. However, a problem arose because the air trapped between the meteoroid bumper and spacecraft surface could not escape fast enough during ascent; a pressure differential built up which tore the bumper off. In the process, the thermal protection on the spacecraft surface was badly damaged, and one of the two big solar panels was torn off. As a result, the electric power available for Skylab operation was substantially curtailed, and the interior of Skylab heated up to dangerous levels under the solar heat influx. A frantic effort immediately began on Earth by Marshall, Johnson, and several of the industrial firms to repair the damage as far as possible. This work was organized and led by Rocco Petrone, at that time director of the Marshall Center. A sunshield was built that could be deployed by astronauts like a closed umbrella through one of the airlocks provided for scientific instruments. Launching of the first astronauts was delayed a few days, but they succeeded in bringing the temperature inside the overheated Skylab back to normal with the help of the sunshield, and they managed to get the normal operational procedures going on the reduced electric power level. The first crew - Conrad, Kerwin, and Weitz - stayed 28 days in Skylab; the second crew - Bean, Garriott, and Lousma - stayed 59 days; and the third crew - Carr, Gibson, and Pogue - 84 days. Damage control proved to be a full success, and the Skylab project turned out to be by far the most prolific and successful scientific and technical enterprise in space. The scientific yield was overwhelming; for example, there were 40,000 photographs taken of the Earth's surface! Our knowledge of the Sun rose by a dramatic jump, the first crystals under microgravity were grown, and our data base for biomedical effects and reactions under the weightlessness of space increased decisively. A total of about ninety different experiments and observations were carried out on Skylab, prepared and monitored by scientists from numerous universities and research institutes. Besides all these accomplishments, there was the assurance for the space engineers that it is really possible to repair a badly damaged spacecraft in orbit, and to restore it to almost normal functioning. By all standards, Skylab was an impressive success. Its cost remained relatively low because most of the major components could by taken over from previous projects; it yielded an unexpected wealth of new data and knowledge, and it clearly showed the way toward further experimentation and observation on succeeding Skylabs which would profit immensely from Skylab I. Actually, plans for Skylab II and Skylab III were immediately pursued; a family of several Skylabs would represent an excellent basis on which later, more elaborate, and more permanent space stations could be planned. This thought had been expressed by von Braun at the time when Skylab I was in its planning stage, and it was considered a matter of course by the engineers and scientists who had been involved in Skylab I. To them, it came as a shock when they learned that NASA had decided to discontinue the Skylab program, and to forego reaping the fruit that appeared so close with reach at that time. They had to be satisfied with the rich harvest of Skylab I, with Skylabs in museums, and with the memory of an exciting and eminently successful project in 1973.